Cleaning & maintaining the hearth and fireplace are more efficient when you have a full set of high quality fireplace tools. The traditional Victorian styling is a main feature of this classic fire pit tool set. 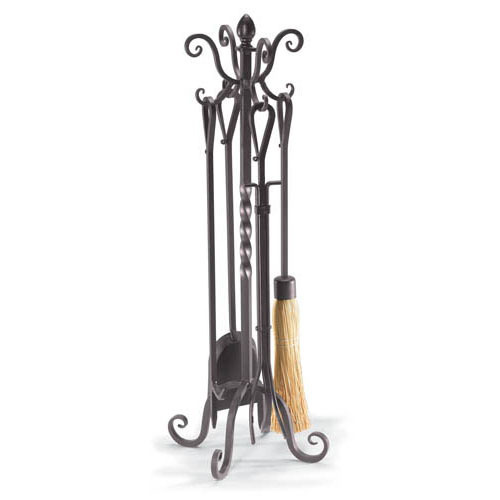 This Napa Forge fireplace tool set features a twisted fireplace stand and a classic Victorian design. The five Piece Victorian Fireplace Tool Set features a brushed bronze finish. This fireplace tool set includes a poker, a shovel, a set of tongs, a broom, and a twisted stand. This set is incredibly well crafted. The tools are built to last and the bronze look is beautiful. I also like the length and weightthese suit me perfectlyand they dont threaten to tip over when in the stand. The slenderness of the tools also keeps them from taking too much space. Well done. I couldnt be happier. Ive looked at a lot of fire tool sets, and this one beats them all in aesthetics, price, and quality. I was looking hard for tools that lacked easy loosening parts. These tools are entirely forged and meet that qualification perfectly.